Written with the same wit and clarity that made Robert Kaplan's The Nothing That Is an international best seller, Out of the Labyrinth offers an engaging and practical guide for parents and educators, and a delight for anyone interested in sharing the pleasures of mathematics. The Kaplans begin by describing the state of modern math education - the lockstep acquisition of "skills", "number facts", and "mad minute" calculations. Instead, they argue, math should be taught as the highest form of intellectual play, an endeavor to be explored and enjoyed by children (or adults) of any age. One by one, they dismantle the many barriers to appreciating mathematics, from the self-defeating belief that mathematical talent is inborn, to the off-putting language of mathematics, to the question of why anyone should care. They show, for instance, that mathematical ability is not a matter of inborn genius, but of doggedness and attention. Even Einstein admitted that "I know perfectly well that I myself have no special talents. It was curiosity, obsession, and sheer perseverance that brought me to my ideas." 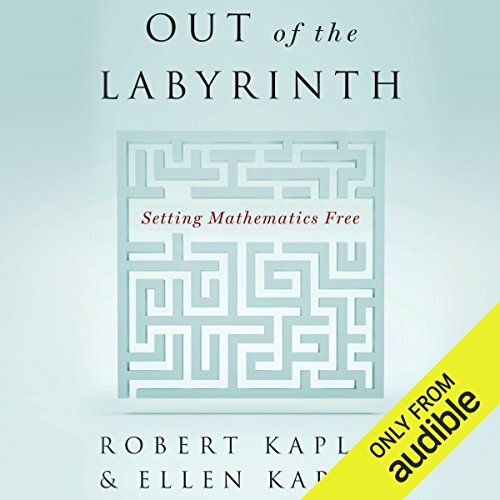 Enhanced throughout with puzzles, practical equations, and colorful anecdotes from their own classrooms, Out of the Labyrinth will delight listeners with its engaging exploration of mathematics. It will allow students, parents, teachers, and others to wrestle with the accessible mysteries of math - and discover their inner math genius. ©2007 Robert Kaplan and Ellen Kaplan (P)2013 Audible Inc.
Fabulous book and even better approach to teaching. This is a 'must read' for anyone with even a passing interest in mathematics. This beautiful book is sadly marred by mispronouncements of common math words and in a truly disturbing (ironic?) way by narrotor's complete unfamiliarity of the subject. When discussing function machines narrator reads text as "f times x is equal to..." instead of "for of x is equal to...". One truly wishes that he had had an opportunity to join a math circle as clearly his education hasfailed him.